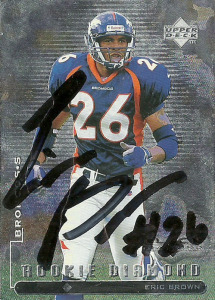 A devestating hitter for the Denver Broncos, the Texans were surprised to see Eric Brown available in 2002. Originally drafted by the Broncos back in the second round of the 1998 draft, he spent 4 seasons there, starting 52 of 53 games. Over that period Eric tallied 273 tackles, 5.5 sacks, 6 fumble recoveries and 6 interceptions, earning a Super Bowl ring in XXXIII. Needing a presence at Strong Safety, Brown started opposite Matt Stevens and anchored down an intimidating group that included corners Aaron Glenn and Marcus Coleman. 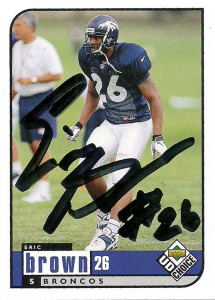 Eric recorded 60 tackles, .5 sacks, and 2 interceptions for 7 yards in 2002. Brown in 2003 had 72 tackles, .5 sacks, a pick, and 3 forced fumbles. Eric only started 4 games in 2004, and due to a lingering knee injury was shelved for the majority of the season. In 2005, head coach Dom Capers and GM Charlie Casserly boneheadedly decided to get rid of nearly all of their expansion players and veteran free agents that joined the franchise during the expansion season. Brown was cut and his career ended shortly thereafter. While Brown has been quoted as saying that his heart was always in Denver with the Broncos, he’s joined the Houston Texans Ambassador program. Last year, when I attended the Kemah Kickoff, I gambled that I might need a few cards of his in the future and scrounging around for a few of Eric paid off. 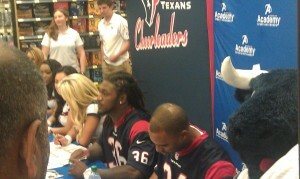 Appearing alongside DJ Swearinger for the Houston Texans Stampede Tour at Academy in Austin for 2014, he was surprised to see a card of his, and told me that he hadn’t signed one in a long time.